I went painting yesterday, rushing to paint the shadows between the trees as the sun sank behind them and my toes and fingers grew colder and colder. 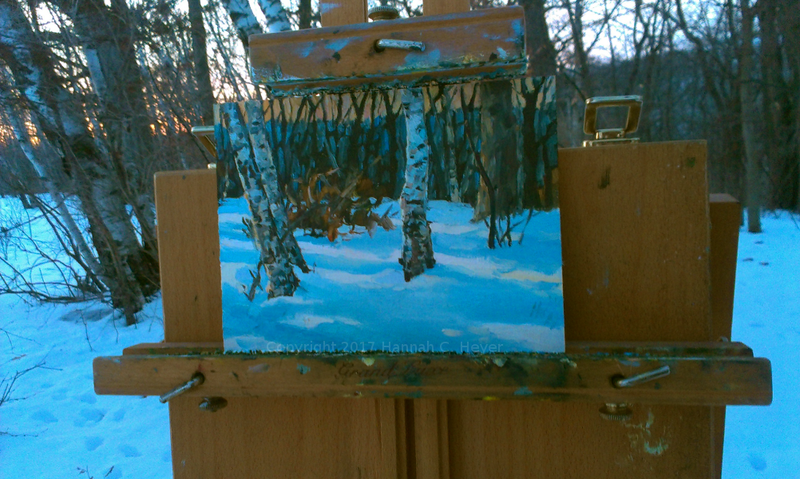 Birch tree study, 6 x 8 inch, plein air, oil on linen/birch. The air was icy, and stung. Still, as I went up the hill and saw the moon rising I stopped and tried to catch that in paint too. The results were pretty messy, and I ran out of light (and working fingers) too soon. 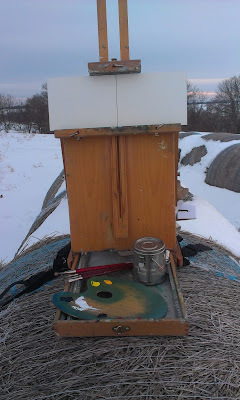 And then my easel had a problem, and I lugged it home, up hill, without folding it up. I wouldn't recommend the practice. Still, getting to see that moon, away from the yard lights, rising above the dark trees, lighting up the snowy hillsides, was worth it. And I hope my messy little painting will be a useful study and help bring it all to mind again. 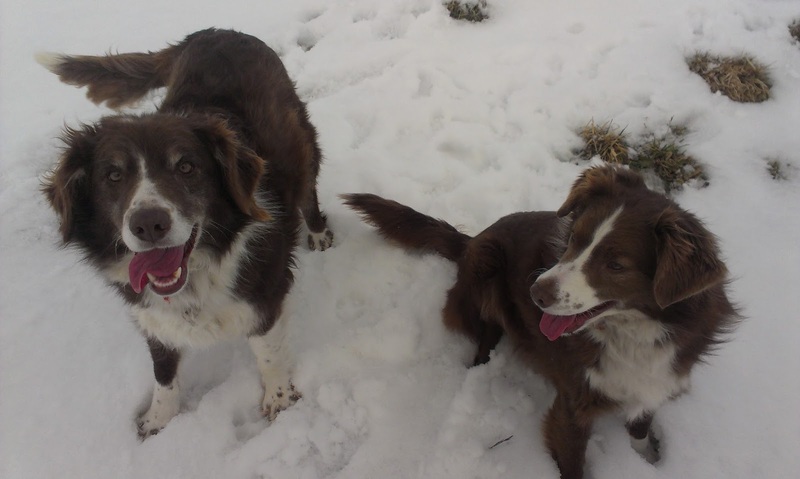 The pups are always up for some aimless wandering! After backtracking, I headed east and found a good vantage point on top of some round bales. It was a little warmer there, not being directly on the snow, but it was not out of the wind. Feeling rusty and running out of time? Better try two paintings. 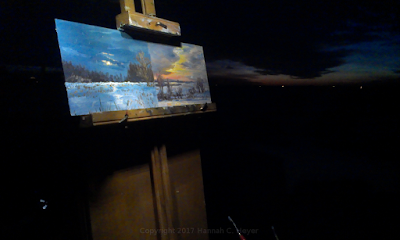 I was really hoping to catch the moonrise, but with the clouds moving in I wasn't sure I'd see it at all, and I also wasn't quite sure where it would appear, making it difficult to do any blocking-in or preliminary sketching beforehand. In the meantime, the sky to the south and west was getting better and better. Time to move some paint! I was still working on the trees in the foreground when the moon came up. Then it was a sprint, getting as much information painted as I could before the moon disappeared behind the next cloud, or the light changed too much. The last colors of sunset. I recently got a couple of music stand lights to try using as easel lights (as an improvement over last summer's phone-flashlight nocturne attempts). I meant to save them for spring, but it was so mild today (and I am impatient) that I brought one of them along. It worked well! Most of the painting was done while I could still see my palette, but things get a bit iffy when the light gets too dim. I could still see my subject well enough, but it was harder to tell just what color I was mixing. It also helped to see when cleaning up! 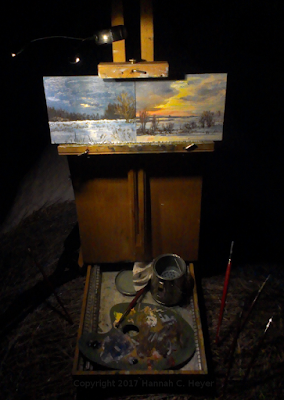 Moonrise study, and sunset study, 6 x 8 inch, plein air, oil on linen/hardboard.